The late 1960's and early 1970's were a time of social unrest which saw the emergence of the national African-American Civil Rights Movement and the revolutionary Black Panther Party. A political rally at Irving Park to encourage "revolution" in the African-American community turned violent during the riots of August 1967. Mayor Terry Shrunk and Governor Tom McCall requested that the National Guard and State Police be ready to intervene if the situation could not be managed alone by the Portland Police. Volga German businesses were damaged during this disturbance (some by firebombs). The riots were followed by continued unrest in the area for several years. More violence in 1969 and 1970 damaged long established businesses such as Repp Bros. Grocery and Market, Weimer's Furniture and Hardware, Geist Clothing and Lincoln Park Grocery owned by Adam Bihn. In September of 1970 the increasing tension and violence spilled over into the Albina residential community with tragic results. 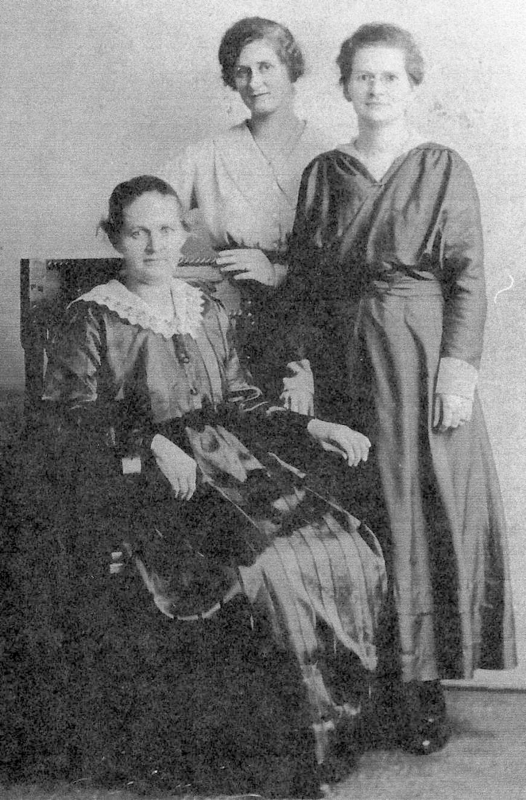 The Block sisters: Alice, Mary and Katherine (center). Courtesy of Kimberly Henkel-Moody. Katherine Elizabeth Block was born on February 13, 1894 in Lincoln, Nebraska, the daughter of Nicholas Block and Katherine Elisabeth Müller who were born in Walter, Russia and immigrated to the United States in 1886. Between 1900 and 1908 the family moved from Ritzville, Washington to Portland. Katherine was confirmed on April 19, 1908 at the St. Paul's Evangelical and Reformed Church by Pastor Jacob Hergert. In 1910, Katherine was working as an inspector at an iron foundry. She married Henry Arthur Krieger in 1913. Henry was also known by the nicknames "Harry" or "Fuzzy". By 1920, Katherine and Henry had three children: Bernice, Lucille, and Harold. The 1940 census shows that Katherine and Henry were living at 3977 NE 6th along with a boarder, Edna Treblehorn. Henry is shown as both a "scavenger" (garbage hauler) and working at a beer parlor. By the summer of 1970, Katherine had lived in the Albina neighborhood for over 60 years. Henry died in July 1946 and Katherine had long been a widow. Katherine continued to live with her friend Edna Treblehorn in her two story home on NE 6th, not far from the where the riots had occurred in Irving Park. Several juveniles thought to be members of the Black Panthers began to harass Katherine for unexplained reasons. The harassment continued to escalate and a police reported dated September 15, 1970 shows that Katharine's home was illegally entered by two juveniles who broke a window, ransacked her house and fled before they could be caught. Around September 20th, several of her harassers observed Katherine talking with arson investigators about a recent fire in the neighborhood. On the same day, Katherine attempted to buy a dog for protection. Around midnight on September 21st, the arsonists crept into Katherine's back yard and doused the ground floor with a flammable liquid which was quickly set ablaze. 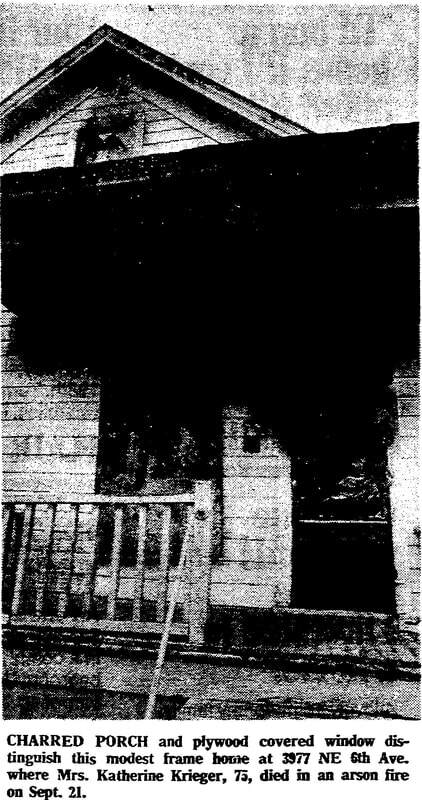 Four of Katherine's African-American neighbors saw the flames and broke into the house, rescuing Edna Treblehorn who was sleeping on the first floor. A wall of flames prevented the rescuers from accessing the stairs leading to Katherine's upstairs bedroom. Tragically, Katherine was trapped and burned to death. Portland police and arson investigators from the Portland Fire Bureau began a probe into Katherine's death which was listed as a homicide. A reward of $750 dollars was offered on October 1st for information leading to the arrest and conviction of the arsonists. The reward money was posted by the city and Fire Commissioner Connie McCready. The reward was increased to $1,575 on October 7th. Commissioner McCready reported that the city had received "numerous anonymous tips and information which are beginning to point to the killer or killers." ​Newspaper articles at the time reported on the intense fear resulting from this crime, especially with elderly residents (both black and white). Those responsible for the murder of Katherine Krieger have never been identified and the case has gone cold. "Police Say Fire Victim Harrassed". The Oregonian [Portland]. September 24, 1970. page 32. "Arson Death Probe Sought." The Oregonian [Portland]. October 1, 1970. page 18. "Fire Death Fund Grows." The Oregonian [Portland]. October 7, 1970. page 17.